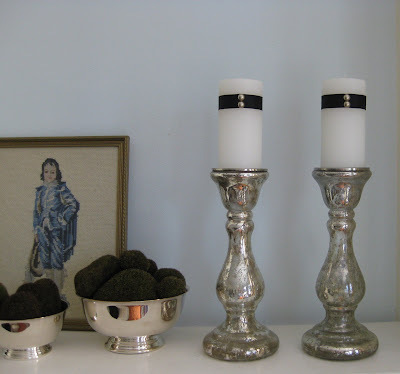 I have these pretty mercury glass candle holders with some plain white pillar candles on them but they were a little boring and lost on my bookshelves. I might be going a little overboard with all the nail heads, but I so love them right now! These look so great and I love those candle holders! Not over the top, I love them toO! And the great thing about this project, in keeping with the same idea, is to replace the nail heads with something else decorative! I have never seen this done before. Pretty cool little detail. Oh I love that you added a little bing to the candles. Love them! I'm in a nailhead sort of mood as well. Have yet to get them in mail yet,but I'm sure I'll be using them everywhere! Hmmm . . . I don't see a photo(?) Maybe it's my browser . 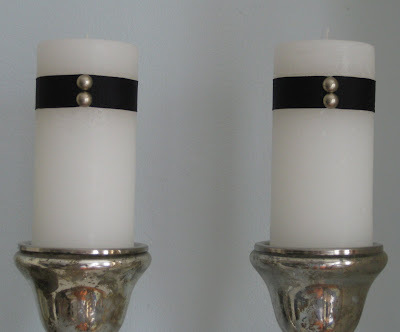 . .
What a great idea - I love the little splash of crisp black! great idea!! you'er so full of them!! the pics you took are so beautiful too! !